New and Venerable Institutions: "The Griddle"
The new Union Square (inset), aka The Griddle. 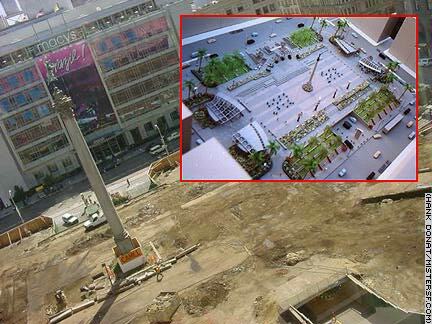 A redesign of Union Square, the 2.6 acre downtown plaza named for historically significant pro-Union rallies that were held here, is one of many public works projects that have essentially refaced San Francisco since the Loma Prieta Earthquake in 1989. The new layout is dubbed "All the Square's a Stage," by its creators but Mister SF can think of it only as a giant griddle. Features include a cafe, visitor information pavilion, a commemorative timeline of San Francisco mayors, podiums for use by street performers, and greater street access. Green and gold granite dominate the plan, seen here in the inset photo. "Green and gold are symbolic of the dunes and grasses that were once in the area," says April Philips, who designed the plaza with architect Michael Fotheringham. The new park features even less green space than the previous version - designed in the 1941 by Timothy Pflueger - which Herb Caen said was half as soft and inviting as the landscape that came before it. (The '40s design added what was then the world's first subterranean parking garage.) Mister SF prefers actual grass over the symbolic kind, and apparently so did Mister Caen. The outgoing Union Square landscape is exquisitely photographed and archived for all time as the principal location for Francis Ford Coppola's 1974 thriller, The Conversation. This is widely counted among the best films of the '70s. P.S. The real "new Union Square" is Yerba Buena Gardens.